Natural-Immunogenics manufactures the purest, safest, and most effective colloidal silver hydrosols ever seen in the history of colloidal technology. 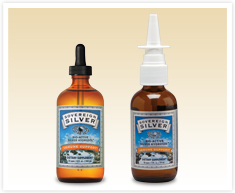 Sovereign Silver® is the number one selling colloidal silver product in health food stores. This crystal clear and virtually tasteless supplement is the silver of choice because it is made from 99.99% pure silver and ultra-pure, medical-grade water (the only other ingredient) in a safe, low concentration formula of only 10 parts-per-million and it has the smallest average particle size (8 Angstroms).